About the Producers . Episode #9 was produced on April 4, 2012. On this episode, learn how to checkmate with two rooks vs a lone rook! In Lauren and Barbara's first video clip, they fly and drive to Las Vegas to check out the 2011 North American Open chess tournament. 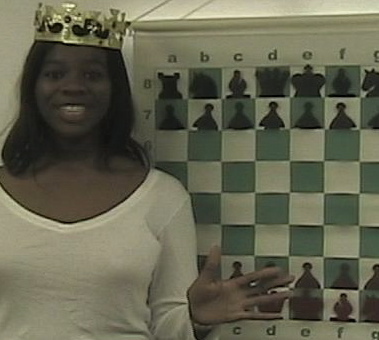 Watch exclusive interviews with two chess players, including Amanda Mateer, a lady chess master! Also watch a short video about the Hip Hop Chess Federation event that took place in San Jose, California in February 2012. Lauren and Barbara have other interests outside of chess, so we'll show you what they like besides chess! Fun fact: Barbara knows how to unicycle backwards! If you live in or very close to Palo Alto, California, then you will most likely be able to watch it on television! Click here to find out times and dates! To watch this episode with a higher resolution, click here.